It is sometimes said that Australia is the oldest continent. It is just as often countered that this is impossible, as all the continents must be the same age. In a way, both of these statements are true. Sure, all the continents—or rather all that became the continents, either by breaking apart and drifting or running into other broken bits—appeared at the same time. However, all the other continents besides Australia are currently, or at least recently, undergoing some sort of dynamic change that makes them younger, whether we’re speaking of volcanic activity adding actual land or tectonic plate movements pushing land up (the Himalayas are still growing) or down (subduction zones where earthquakes are common). A lot of what you’re looking at on these younger continents is recently added. In Australia, none of that stuff has happened for millions of years. The landscape is not created by volcanoes or uplift zones, but rather by erosion. The Great Dividing Range, for example, is not actually a mountain range, but rather all that is left of a huge plateau that has slowly been eaten away until all that is left is a long strip that runs like a spine up the eastern side of Australia. That’s why it was so hard for the first explorers to cross the Great Dividing Range: there were no passes. It was only finally crossed when explorers figured out you had to get on top of it, and then walk along the flat top to the other side. Australia does have real mountains—lots of them—but most of them are fairly worn down. Australia’s highest peak is Mount Kosciuszko, which stands 7,310 feet high. Like all the rest of Australia’s real mountains, it started out much taller. All over Australia, there are remarkable formations created by this history of erosion. Often, hard minerals that would be veins in mountains in other places stand alone because the mountains have washed away, as is the case with both Broken Hill and the long ridge of quartz known as the Great China Wall. Other places, it is the veins which were softer, and while the surrounding rock remains, the veins are gone. 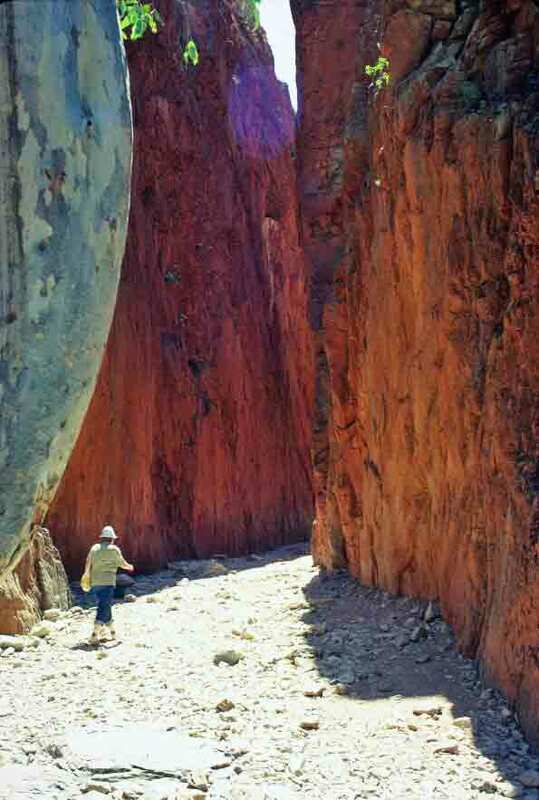 This is the case with Standley Chasm, one of the wonderful formations worn into the red rock of the MacDonnell Ranges. Here, the softer rock has been eroded away, leaving a 15-foot-wide channel through the wall of rock. Everywhere one goes in Australia, there are wonderfully wind- and water-sculpted rocks, from the “beehives” of the Bungle Bungles in the north corner of Western Australia to the Remarkable Rocks on Kangaroo Island to the fabulous caves in Tasmania. 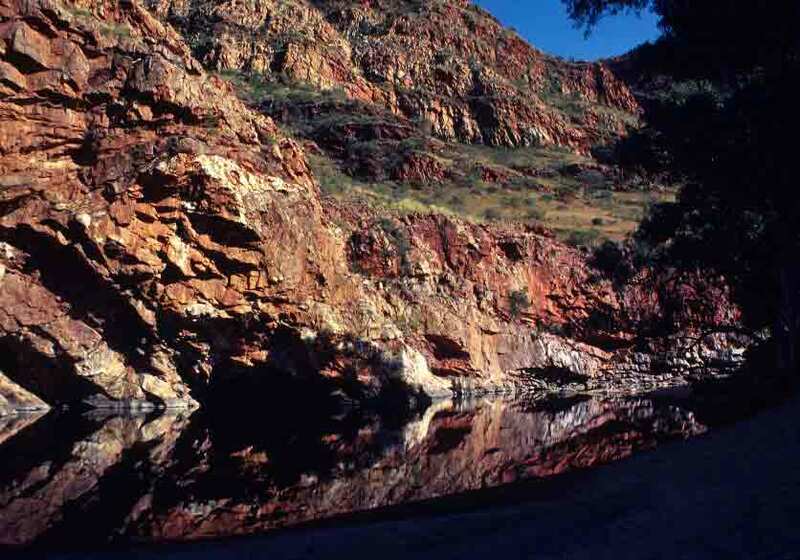 The photo below is of Standley Chasm, which we saw on the same day we visited Ormiston Gorge. The walls close in as you get farther into the chasm, until the sky is just a strip of light far overhead. We had spent more than a week seeing the wonders of the Red Centre, but still Ormiston Gorge surprised us with its beauty. The gorge is more than simply stunningly beautiful, however. 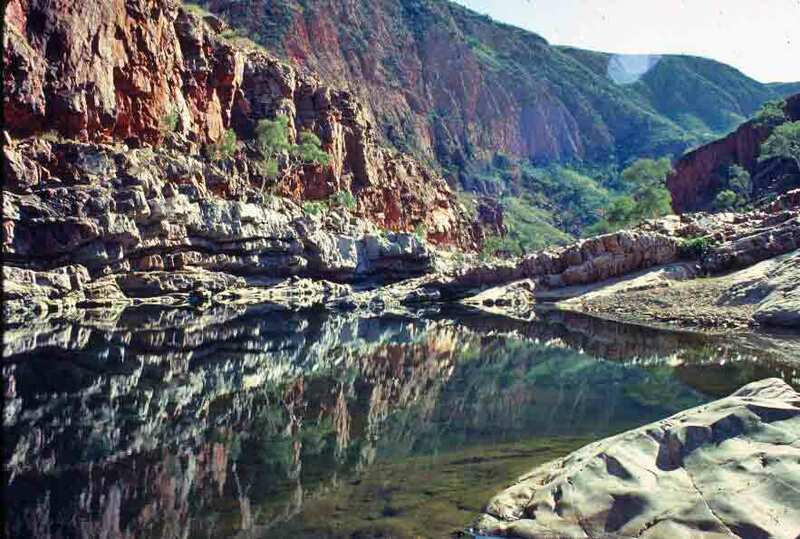 It is one of the best places to view the complex geology of the MacDonnell Ranges. It has remarkable flora and fauna, including species of plant that survive from an earlier time, when this was not a desert. And it has a surprisingly reliable waterhole—almost permanent and up to 40 feet deep in places. Great river red gums guard the entrance to the gorge, as you can see in the first photo below. The gorge walls rise unevenly, wonderfully broken and eroded, creating a glorious backdrop (second photo). And the clear water reflects the complexly layered rock (third photo). As you’ll know if you’re reading my book, I was quite delighted with the appearance of the spinifex grass that I saw growing everywhere in the Red Center—and that I would see so many other places in Australia. I described it as looking like “herds of golden hedgehogs.” Of course, the golden part depends on whether there has been rain or not, because new growth is green. But these grasses turn golden as they dry, turning their rounded hummocks a pale tan that contrasts nicely with the red earth. Interestingly, the spinifex grass of the Outback is not a member of the genus Spinifex. The genus Spinifex is a group of grasses found in sandy habitats along coastal beaches. The spinifex of the arid interior belongs to the genus Triodia. As happened so often in the New World (the Americas as well as Australia), travelers and exploreres picked up one name and stuck it on new things they encountered that were somewhat similar but not necessarily related. Well those hummock grasses of the genus Triodia that had caught my attention in the Center are, in fact, the dominant vegetation of more than 20 percent of Australia. They occur in all states except Tasmania. However, there are 64 species that have been described thus far, so not every hummock of spinifex looks identical to the others, with variations in roundness and height being the most obvious differences. Spinifex is classified as a hummock grass because it grows in a dense hummock, or dome shape. Even when there has been rain, the only green will appear on the outside of the hummock, protruding from the densely matted hummock of matted stems and dead leaves. Many species of spinifex are extremely resinous—to the point that resin will actually drip down the stems and leaves on hot days. This resin was traditionally important among many Aboriginal groups, as it could be heated, molded, and used to attach spear points to shafts or repair work instruments. Even today, in a pinch, spinifex gum is used to repair leaking buckets or broken tools. 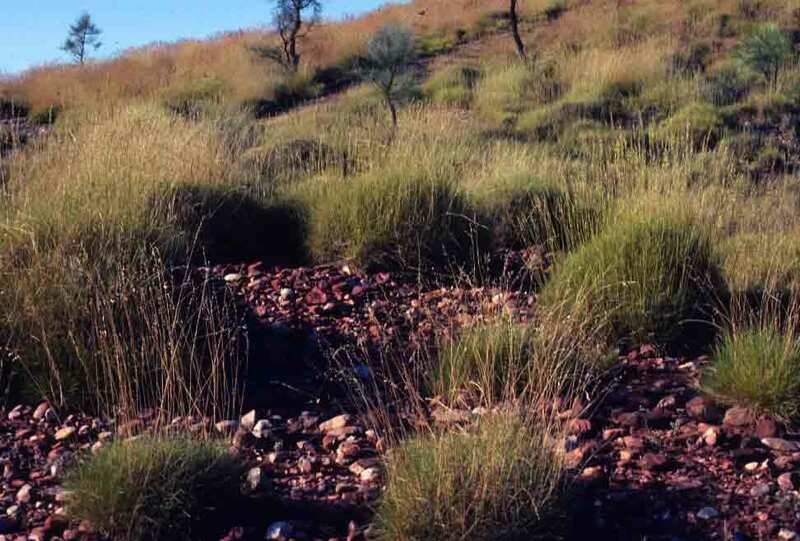 In the photo below, the spinifex shows much new, green growth—but it also clearly shows the rounded, hummock formation that is characteristic of this Outback grass. Sunrise at our camp near Glen Helen Gorge. We are nearing the end of our Red Centre tour, and though we have to pack quickly, as there is a full day ahead, we still take time to appreciate our location, with everything painted by the pastel light of the rising sun. Unfortunately, what film doesn’t capture is the coolness of the air, the fragrance of the scrub, the singing of the birds, the absolute wonder of this place and this time of day. It is so peaceful and lovely, so clean and fresh. Two of the names one encounters frequently in Australia’s arid Red Center are Sturt and Stuart. It is worth pointing out that they are two different people simply so everyone knows that Sturt is not a typo. Charles Sturt and John McDouall Stuart were among Australia’s most important early explorers, and both spent most of their time hiking around hot, dry parts of the country. Actually, Sturt was Stuart’s boss for a while, and Stuart was along on Sturt’s sole Outback adventure (1844-45). However, though both men got sick (scurvy) on that trip, Sturt never recovered and never went back, so Stuart went on to be the more important explorer, with six expeditions into the interior (1858–62). In 1860, Stuart succeeded in crossing Australia from south to north. The names of both men dot the landscape of the Outback, from the Stuart Highway, which follows Stuart’s path northward from South Australia across the continent, to the Sturt desert rose, which Charles Sturt collected and commented on during his wanderings around the Centre. The Sturt desert rose (also known as Sturt’s desert rose) is the floral emblem of the Northern Territory. Not a rose at all, Gossypium sturtianum is in fact a species of hibiscus. 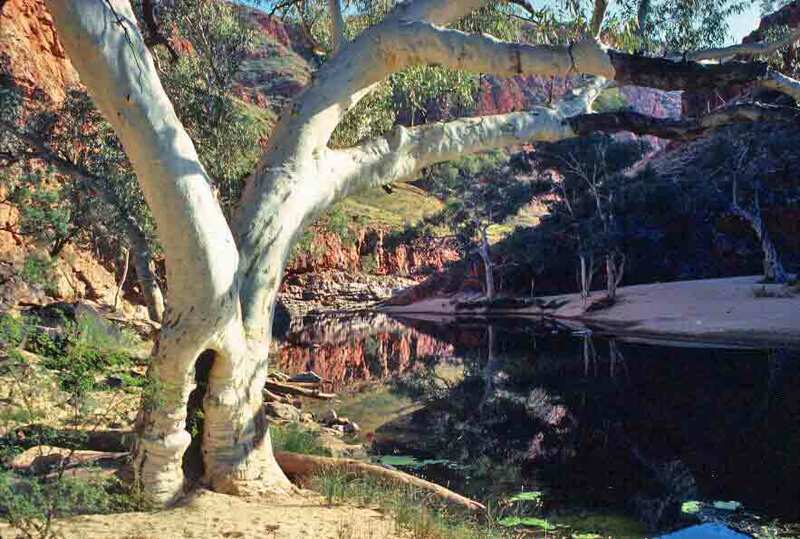 The compact plants tend to grow in the Outback’s dry creek beds. The lovely pink blooms are all the more surprising for their arid surroundings. 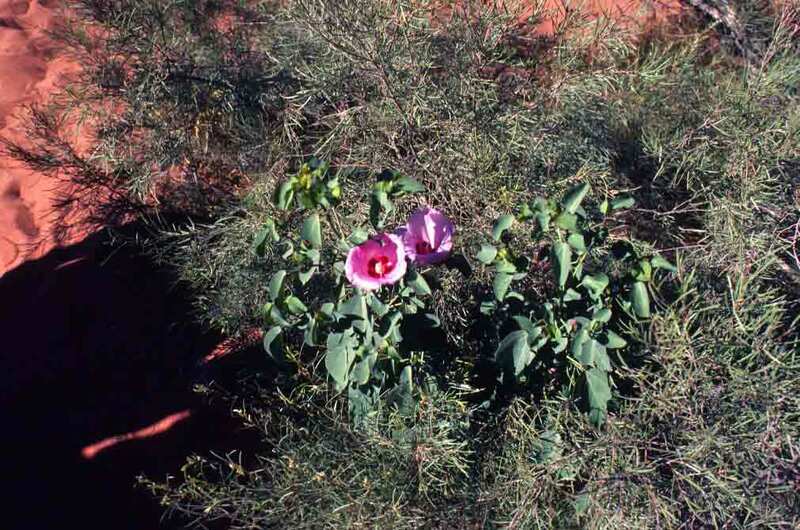 Here’s a Sturt desert rose we encountered in Finke Gorge. 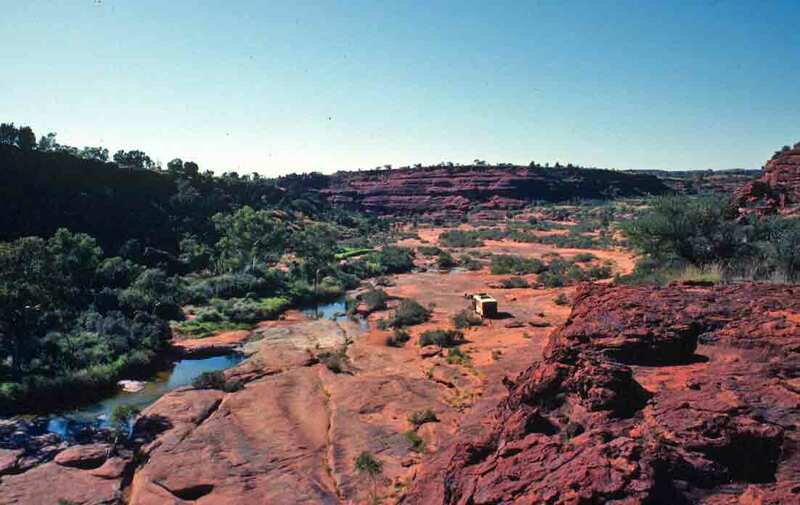 Finke Gorge National Park covers an area of 46,000 hectares—which somehow sounds a lot more impressive than 177 square miles, though the two figures represent the same area. 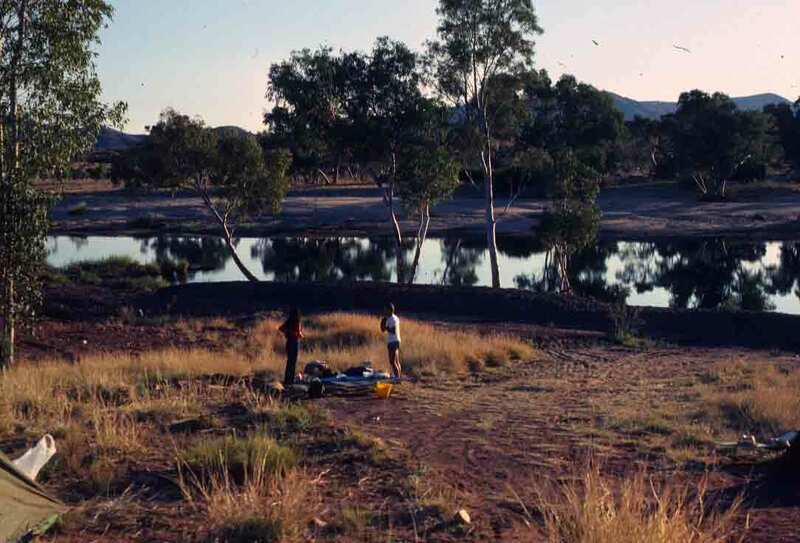 At the center of the park is the ancient, rocky, and usually dry Finke River. The river is wonderful, but the real reason we bounced and lurched along its rough bed, after leaving Kings Canyon, was to visit what is considered one of the most impressive features of the park: Palm Valley. Palm Valley is impressive for a number of reasons. It’s lovely. It has a spring, which makes it an oasis in this arid region. And it is home to a diverse range of plant species, many of them rare and unique to the area. The plant that gives the valley it’s name is among those rare and unique species of flora—the Palm Valley Palm, also known as the Red Cabbage Palm or Central Australian Cabbage Palm. Livistona mariae subspecies mariae, or Palm Valley Palm, is a fan palm that can grow to sixty feet in height. It grows here and nowhere else. The entire population of these rare palms is around 3,000 adult plants. There are other Livistona species elsewhere in Australia (though none of them is close to Palm Valley), but this is the only place you can find this particular subspecies of palm. Below is a photo of the entrance to Palm Valley. You can see our 4WD on the floor of the canyon, as we look back to the spot where we started our climb. We were to see far more palm trees and water as we continued our hike into the valley.